The final round of the Championship is now underway! Feel free to discuss your rally & post any pictures, videos, gameclips, stream links, summaries etc. from Round 6 in this thread. Good luck to all competing teams & drivers in the last round of the season! I`m pleased to say that N-Sports only remaining driver has completed Rally Wales and stands proudly at the top of the leader board. The stages were tough but really enjoyable and after a smooth start, N-Sports number one driver Sloe, ran in to some problems, all was going well until the start of the last of the night stages where Sloe lost all his lights after a spin resulting in having to complete the rest of the stage in darkness. Sloe said "I was caught out early on in there, I`m sure I saw Kylie in her hot pants at the side of the stage and lost concentration, what an arse!" Then while trying to make up time in the next stage Sloe rolled the pig of a Ford Sierra deep in to the scenery but managed to limp on to the end of the stage in a trashed Sierra. Things didn`t improve on SS11 either, a few spins in there costing valuable time. A deep breath, calm and concentrated and back in to a steady flowing pace on the last stage left Sloe overall quite happy with his performance. It what a fest of barrel roll, bank hitting, mistakes. 360 spins... I've started to drive safe at SS11. Still a beautiful battle between Sloe and I. After SS10, he was 2 min faster than me at the overall. But, because of his mistakes and my aerodynamics little secret setup, I've reduce the difference at more or less two tenth. Unfortunately, he was to fast on SS12, and I finish à 3 sec behind him. I hope you will be here on next one. Still a beautiful battle between Sloe and I. Drivers have until this Thursday to complete the final round of the season! Round 6 and Season 7 are now complete! Thank you to all teams and drivers who participated in this season of the DSRL RC! 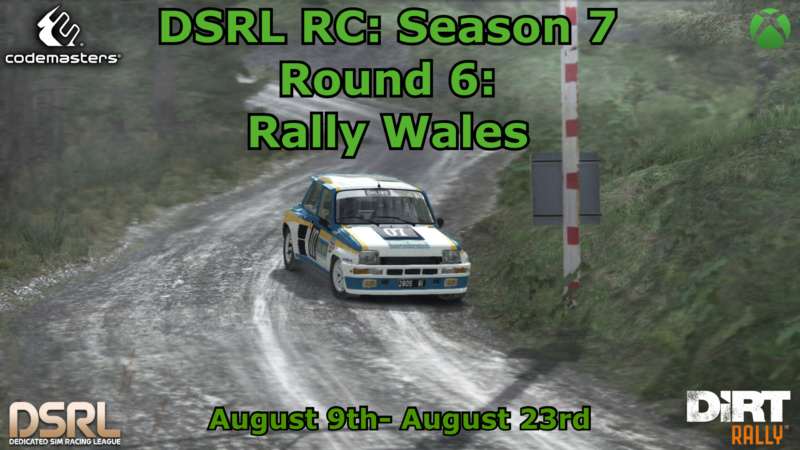 Leagues have now become available again on Racenet, finally allowing the Rally Wales results to be viewed. Sorry for the delay. Congratulations to VinceBartok, who wraps up the drivers championship with a very dominant win in the final round of the season! He claims his 3rd win of Season 7 in Wales, enough to edge him over 2nd and 3rd in the championship standings overall. Meanwhile in the team standings, Ford Performance claimed the teams championship in their Sierra Cosworth RS500's with an 8 point advantage over the Race Clutch BMW's after the final rally. Due to the Racenet downtime, drivers who were unable to start the final rally will not be penalized for a DNS in this round. Thank you and well done to all involved this season!